Women University, Swabi has announced to celebrate annual Studentsâ€™ Week, starting from 1 April 2019, Vice Chancellor Khanzadi Fatma Khattak will grace the inauguration ceremony, to be held on Monday, as Chief Guest. Student week is celebrated with the aim, to develop confidence and leadership qualities among students. Vice Chancellor Khanzadi Fatma Khattak encouraged the students to actively participate in competitions to explore their hidden talents.She also urged the students to showcase the spirit of sportsmanship at any cost. 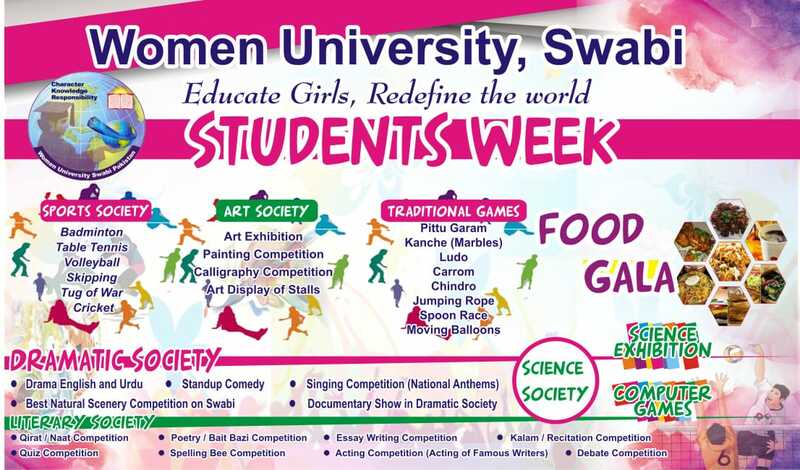 The purpose for celebrating studentsâ€™ week is to provide a platform to students of women University, Swabi for proving their true potential in different sports and other activities, such as cricket, table tennis volley ball, cricket, traditional games and dramatic, debate etc. In week long event food gala, singing competitions , qirat competition, photography competition will also be part of the studentsâ€™ week.